After the 400s AD, the Bantu expansion slowed down. They had already settled most of the good farmland in southern Africa. What was left was mainly desert or thick jungle. It was no good for farming or herding cattle. The Bantu left that land to the Khoikhoi and San people who already lived there. But now it was North Africa’s turn to see changes. In 429 AD, the Vandals invaded Roman North Africa, and then after a short Roman reconquest an Arab army conquered North Africa in the late 600s AD. By this time, Africa was becoming more and more involved with Asia through trade. The Islamic faith quickly spread across the Sahara to West Africa, where the kingdom of Ghana was forming. By 900 AD, Ghana was wealthy and powerful thanks to trading slaves and gold across the Sahara desert with the North Africans for salt and silk from China. Mali conquered Ghana in the 1200s AD, and the great Malian king Mansa Musa built the trading city of Timbuktu, with its great university. At the same time, the Bantu settled seaports on the eastern coast of Africa and began trading with the Arabs and the Indians there. The people of Aksum (which was still Christian), in what’s now Ethiopia, traded with Constantinople. East Africans sold ivory, gold, gum arabic, iron, furs and enslaved people. They bought Indian cotton cloth, glass beads, steel for knives and swords, Central Asian paper, Iranian sugar, carpets, and horses. They even bought Chinese porcelain and silk. Bananas, rice, and sugar came to Africa from India and south-east Asia with these traders. This trade brought a lot of cool stuff to Africa, but Africans didn’t make as much of their own cloth and iron, now that they could buy better cotton and steel from traders. By 1000 AD, the people of south-east Africa had developed a culture that mixed Bantu and Arab together. People there spoke a language called Swahili that was mainly Bantu but with a lot of Arabic words. Like the Ghanians, many of these Bantu converted to Islam. By 1300, the people of Aksum had also converted to Islam. South of Mali, in the Congo River Basin of Central Africa, people formed the Kamilambian culture about 400 AD, based on fishing in the Congo River and its tributaries and selling dried fish. People living a little further south still may have been mining and selling copper. By the 800s AD, the Kamilambian chiefdom grew into the Kisalian state. People began to use iron, and they traded with the East African coast. By the 1300s, the Kisalian state changed to the Kabambian state, which seems to have begun using small cross-shaped pieces of copper as money, and farming spread south to Angola. By 1400 AD, most African people were farmers or herders, with flocks of sheep and herds of cattle. Only in the very center of the continent, and in the remote desert, people were still hunting and gathering most of their food. Many Africans were rich enough to build stone castles and stone walls, and they were using money and fighting to create bigger empires. Many East Africans were Christians, while most of West Africa and the rest of East Africa spoke Arabic and followed Islam. There were universities in Timbuktu (Mali), and in Cairo (Egypt). Like Europeans in the Early Middle Ages, Africans sold mostly raw materials and bought a lot of manufactured goods, but that would probably have changed soon as it did in Europe. That shift did not happen in Africa, probably because a serious climate change interfered. The beginning of the worldwide Little Ice Age, about 1300 AD, brought severe drought to most of Africa, as it did to the Mississippians in North America too. Empire after empire collapsed. Mapungubwe, in South Africa, collapsed in the 1200s, and so did the Almohads in North Africa. In the 1300s, Aksum fell to Islamic invaders, the Kanem collapsed in Niger, and the Sao collapsed in Chad. Possibly the Black Death – the bubonic plague – may have added to people’s problems in the 1340s and 1360s. Great Zimbabwe, in what is now Zimbabwe, was abandoned in the 1400s; according to Mutapa tradition, refugees from Zimbabwe started the Mutapa kingdom. 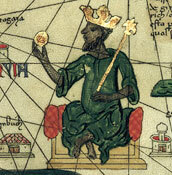 By 1468, Mali in turn fell to the Songhai. 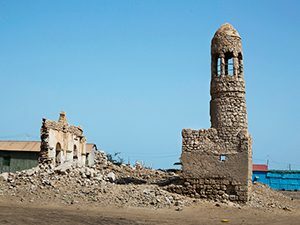 Just before 1500, the Sultanate of Kilwa in Tanzania collapsed too. Trade networks were badly disrupted, though the Songhai kept on trading slaves and gold across the Sahara for salt. 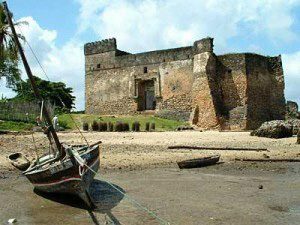 During this terrible drought, just before 1500 AD, the first Portuguese explorers reached African seaports, first in West Africa and then in East Africa. These first European arrivals were traders like the Islamic and Indian traders. And like them, they were also looking for people to enslave. Learn by doing: how many of these African trade goods can you find in your house? Cite this page: Carr, K.E. Medieval African history – Timbuktu and Great Zimbabwe. Quatr.us Study Guides, October 3, 2017. Web. April 25, 2019.